I'm reposting this recipe because it is so dang divine. My husband's face lights up when he walks in the house and smells it cooking. In fact, last time I served this meal my husband kept referring to it as nothing short of “perfection”. He asked me if I had a name for the dish. I told him yes, I did. It's called Crock-Pot BBQ Chicken. "Oh no, no, no," he lamented. "That won't do. You need a good name for this. It's perfection." "Ok, I'll call it Crock-Pot BBQ Chicken Perfection then," thinking this would do the trick. To which he replied, "That's not a suitable name. It's not just the chicken, it's all of it... together. That's what makes it so good." "How about Perfection in a Pot?" I offered. "Oh no, no, no," was his response once more. "This is not about the crock-pot. Nor is it about the chicken. It's about all of it... together. It's hearty. It's tasty. It's easy. You need a really good name." I've been thinking about this for days now. And this is what I've come up with—Perfection on a Bed of Rice with BBQ Chicken and Slaw. That's kind of a long name, I know. So maybe something a bit shorter. How about Jump for Joy BBQ Chicken. Or perhaps something a touch more lengthy would adequately describe it—Make You Want to do Cartwheels in the Middle of your Meal Crock-Pot BBQ Delight. Anyhow, whatever you want to call it, next time you want to put your feet up while dinner cooks itself you know what to try. 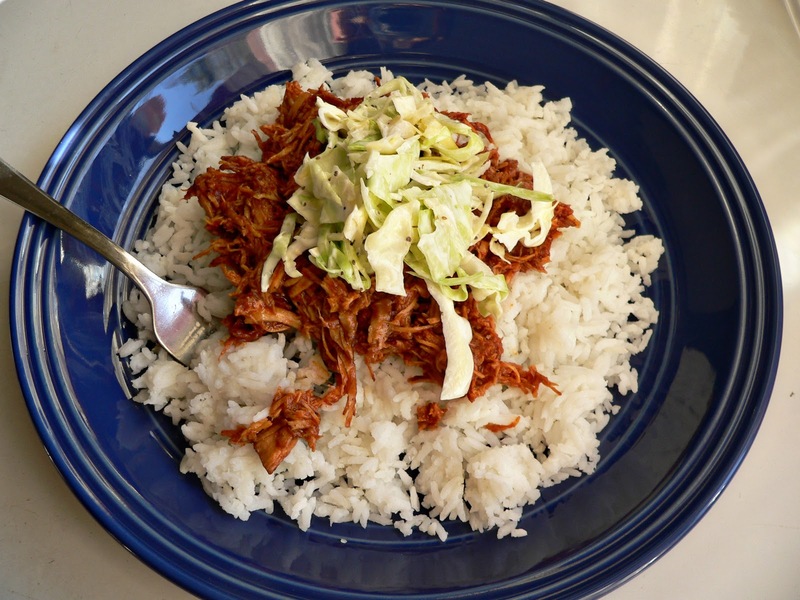 This Cartwheel Inducing, Jump for Joy, Perfection in a Pot on a Bed of Rice with BBQ Chicken and Slaw is nourishing, simple to prepare and surely a crowd pleaser. In the base of a large crock-pot, whisk together the BBQ sauce, Italian salad dressing, brown sugar and Worcestershire sauce. Trim excess fat off chicken breasts. Place meat in the crock-pot. Stir to coat with the sauce. Cook on the high setting for 3 - 4 hours or on the low setting for 6 - 8 hours. Just before serving, take a large spoon and shred the chicken. It will fall apart on its own when stirred around. Mix to coat well with the sauce. Serve over brown rice with a hearty portion of Judith’s Slaw on top. It is done when the chicken separates easily. Serve over brown rice with a hearty helping of slaw, or in a taco shell with slaw on top. You can make this up to one day in advance. Take your time, drink a little wine, and stir it up girl. Combine mayonnaise, rice vinegar, celery seed, salt and sugar. Mix well. Shred the cabbage into thin pieces. Simply cut the head of cabbage into quarters and start slicing into thin strands. It shreds itself. Dump cabbage into mayo concoction. Stir it around. Coat cabbage well. Refrigerate. Done. Something else that makes me want to do cartwheels in the middle of my meal... this song. haha Your husband's concern over the recipe title is hilarious. And only 5 ingredients? That's something I can handle.